-Shortened the leg by one repeat. I don’t like super tall socks (my calves are just too large) but doing only two repeats of the leg chart made for the perfect length leg. 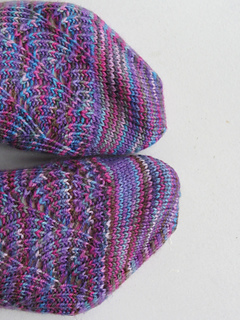 -Cuff Down Socks – To this point all my socks have been toe up, however Cookie is a big fan of cuff down and her pattern are worth not using up every last yarn of yarn doing things cuff down. 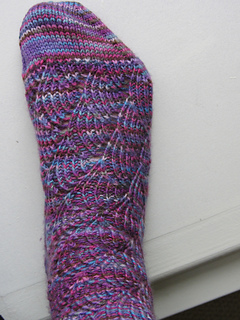 -Twinned Sock Knitting – I tried doing these two-at-a-time, however it was too much trouble with all the stitches that get get passed around as the pattern spirals. 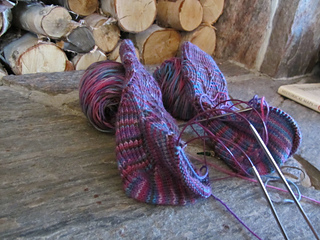 So Carla lent me her short 2.75mm needle and I knit the socks at the same time on two separate needles, doing the cuff on one, then the other. 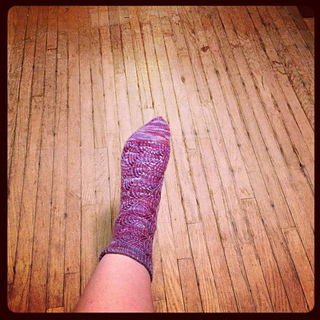 I found this a great way to avoid Second Sock Syndrome and also be able to move stitches as needed. 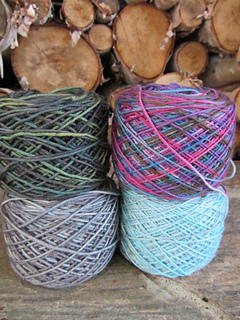 -Yarn: The TFA Blue Label was a great yarn to work with, while there was one really nasty join from the mill it is in the remnants so it wasn’t an issue for the socks. 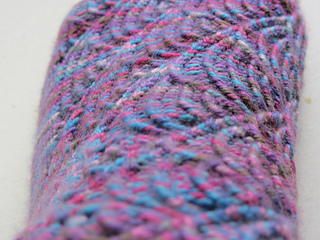 I was impressed with the multi nature of the yarn, it didn’t pool or stripe, it just has a great overall effect, although I imagine the pattern does help prevent the yarn from acting up. Also the stitch definition was just perfect for this project. 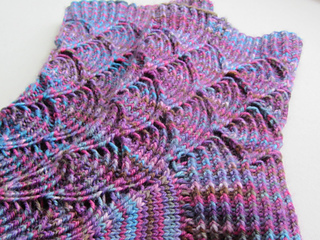 -Pattern: Cookie mentions in the pattern that … “ If you are up for a challenge, then the Pomatomus is for you. Blue fish are somewhat vicious with sharp teeth, powerful jaws, and a cannibalistic tendency. 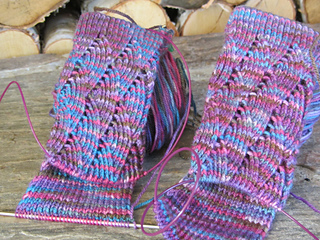 Stay alert, and you should wade through these socks just fine.” I found that they were wonderfully zesty, although making them work on magic loop, rather than DPNs made them a challenge a times, it was well worth the effort. 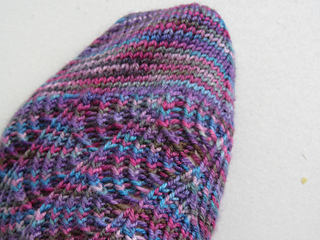 The pattern was good, and the only drawback was the format, I find I have to reformat all the patterns I get from Knitty, because they don’t print properly or save as PDFs in a usable form. Other than that general complaint (about a fantastic, free publication) the pattern is great, I really want to try more of Cookie’s patterns, she is a whiz with the socks. 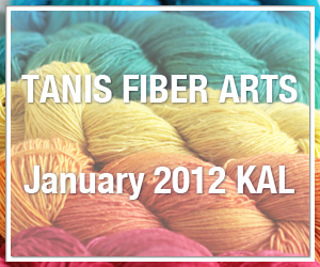 Re-Knit? 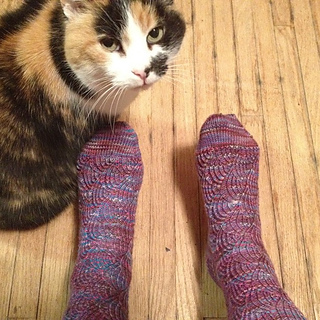 : Probably not, there are way, way, way too many awesome sock patterns out there to do backwards (aside from having a basic vanilla pattern you like) but I am desperate to make more Cookie A socks, she is an artist who creates for tiny, wearable canvasses.